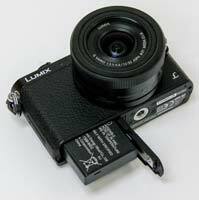 The new Panasonic Lumix DMC-GM1 is one of the smallest compact system cameras in the World. The DMC-GM1 features a Four Thirds-sized 16 megapixel Live MOS image sensor, 1036K-dot touchscreen LCD screen, built-in Wi-Fi connectivity, a pop-up flash, silent electronic shutter with a maximum shutter speed of 1/16000s, Full 60i/50i HD video recording, high-speed Light Speed AF system, focus peaking, RAW support, an ISO range of 125-25600, and 22 Creative Controls. The Panasonic Lumix GM1 comes bundled with the new Lumix G VARIO12-32mm (24-64mm equivalent) f/3.5-5.6 Asph. MEG O.I.S. pancake zoom lens, priced at around £629 / $750. A cool looking camera is surely always going to sell and the GM1 from Panasonic is certainly that. It's not just the fact that it's the size of a pack of playing cards that adds to the compact system camera's desirability, but also that, in its silver and tan faux leather iteration, available irritatingly just via Dixons Travel in the UK, it ticks the boxes for the retro looks popularised by the Olympus Pen/OM-D, Fuji X and Pentax Q ranges. The alternative is the plainer black version of the GM1 we had in to play with. Silver and white bodies are additionally available overseas. Sitting in between Panasonic's existing ‘GH' and ‘G' camera classes, imagine a meld of the same manufacturer's LX7 high-end compact and its GX7 system camera and you'll get a good impression of what the Panasonic Lumix DMC-GM1 is like. 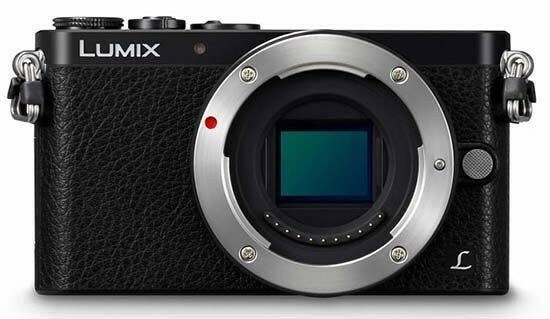 Indeed its maker has stated that the palm-sized interchangeable lens camera seeks to recreate the GX7's performance within a smaller aluminum frame and magnesium alloy body. The Panasonic boasts dimensions of 98.5x54.9x23.5mm and weighs just 203g; a size we found made it ideal for shot-from-the-hip style street photography. Though its diminutive proportions mean that it noticeably misses a handgrip, the leather-effect faceplate prevented our fingers slipping around and in any event, an accessory grip is an available option via Panasonic, as is a case enabling the camera to be worn about the neck. The overall pitch here is that ‘serious needn't be complicated' and the fact that the Panasonic Lumix DMC-GM1 resembles your regular snapshot camera at a distance also ensures it fits easily and unobtrusively into a jacket pocket even with kit lens attached – here a 12-32mm f/3.5-4.6 zoom (24-64mm in 35mm terms) with retractable mechanism made especially for use with this camera. We imagine it would sit as easily in a baggy pair of holiday shorts. Two further specially produced lenses are promised for 2014: a 15mm wide angle plus a 35-100mm telephoto. In the meantime though, body and kit lens retail for £629.99. Seems like a lot for a camera the size of your typical £200 point and shoot; that is until you pick up the GM1 – whereupon you notice a more solid, premium feel build than you might have expected – and start using it. At the same time it's not until you pick up the GM1 that you realise how truly tiny the camera is – not really an impression you can get from an online press shot alone. This is a compact system camera that truly, finally, after five long years, puts the ‘micro' in Olympus and Panasonic's jointly developed Micro Four Thirds system. With the GM1 we get a 16 megapixel top resolution from its 17.3x13mm CMOS sensor, and an ISO range stretching right up to a see-in-the-dark ISO25600 (even if the top two settings are only to be reached for in desperation). There are several things that enthusiast photographers might expect at this price that we don't get from the Panasonic Lumix DMC-GM1 however; its size means that it can't complete everyone's wish list. So there's no articulated back screen, no vacant hotshoe for accessory flash, though a built-in bulb is neatly sunk into the top plate, and no eye-level viewfinder. There's also, slightly surprisingly given that Panasonic has pioneered its inclusion in most recent (larger) G series cameras, no NFC connectivity, though we do get Wi-Fi. We're also provided with a 3-inch back screen with a massive resolution in excess of one million dots, which in practice results in a view best described as ‘life like', which is great, obviously. This being a Panasonic camera, said screen is also a touch screen, though, again this being a Panasonic, many of the on-screen icons are so tiny it requires a degree of precision as to where you place that fingertip. We did also miss the fact that we couldn't achieve further compositional flexibility and angle or tilt the rear screen on the GM1, though inevitably this implementation could have resulted in a physically larger camera. What we have here is a body that resembles Panasonic's high-end premium compacts, such as the LX7, yet one that has the added advantage of being able to change the lens in use, so providing us with the best of both worlds. In its all black incarnation the Panasonic Lumix DMC-GM1 looks pretty minimalist too and unthreatening to anyone upgrading from a smartphone or tablet, as well as those who have handled previous generations of Panasonic Lumix. On the top plate we get a dime/five pence piece sized shooting mode dial with a familiar selection of manual photographic controls and the fully automatic. Smaller, and located slightly nearer to the front plate is a raised shutter release button encircled by what on a standard compact would be the zoom lever; on the GM1 it's the on/off control, accessed with a flick of the forefinger. Along from these two, as we move towards the centre of the top plate, we come to a function (‘Fn1') button, itself surrounded by a lever for alternating between single and continuous auto focus, or manual focus, the latter naturally achieved with a twist of the focus ring on the provided lens. On our camera the function button – which is complemented by a range of virtual on-screen function buttons in the likes of program mode – was preset to call up the camera's built in Wi-Fi connectivity option. We do also get that nifty pop up flash seamlessly sunk into the top plate, activated via its own manual switch. Flick the ‘on' lever, and, as on Olympus Pen cameras utilising the standard issue 14-42mm zoom, we discover that the Panasonic's own 12-32mm kit lens also needs to be fully extended before the camera is operational, this process adding a couple of seconds onto power-up time if you haven't pre-extended the lens. Wisely it also needs an SD card inserted before you can do anything; there is no internal memory cache provided. With camera fully loaded and lens extended however we were able to be up and squeezing the shutter release button for our first shot in roughly two seconds. As you do so there's a visible adjustment to the image as the GM1 determines focus and exposure, before we're able to squeeze down fully and take the shot a second or so later. A highest resolution JPEG takes around 2-3 seconds to write to card. But more impressively, if you're shooting Raw and JPEG combined there's barely any noticeable slowdown in writing speed. The options provided on the Panasonic Lumix DMC-GM1's shooting mode wheel meanwhile will be familiar to most photographers with upwards of £600 to spend. Alongside the creative quartet of program, aperture priority, shutter priority and manual shooting modes we get a dedicated video capture mode, two user defined custom settings, 23 scene modes, plus 22 digital effects modes. For the point and shoot brigade, added to these shooting modes there is the reliable fallback position of iAuto (intelligent Auto). The effects filters here include Panasonic's attractively saturation boosting Expressive mode, always a good option when shooting on a dull day as we experienced when testing this camera late November/early December in the UK. Alongside this we get both ‘retro' and slightly less easy to describe ‘old days' settings – the first lends a milky faded hue to a shot whilst the latter provides a subtle sepia-like tint. Next up there are high key, low key, sepia and monochrome options, plus a further more contrast-y ‘dynamic monochrome' as well as a grain-heavy ‘rough monochrome' and a ‘silky monochrome' that would be perfect for photographing a 1930's Hollywood starlet. High dynamic, cross process and toy camera options all follow, along with miniature effect, cross process, star filter, single colour isolating and ‘sunshine' settings; so a comprehensively creative range of options from such a small camera, all told. Scene modes meanwhile include a very useful ‘handheld night shot' option which takes a short burst of images and combines them in a bid to prevent blur – though we did, perhaps inevitably, notice a double exposure effect when photographing a group of dancers in motion. Further to this there are the usual optimized options for taking pictures of what you had for dessert or the pet dog (hopefully not one and the same), no fewer than four portrait options – or five if we count the one dedicated to a ‘sweet child's face'. There are also seven options for taking photographs at night – including the burst shooting option – dedicated either to either portraits or nighttime landscape shots. The GM1 does seem commendably dedicated to helping the user achieve a wider range of results in a wider range of shooting conditions, without that self same user necessarily needing to know all that much about photography. Added to all the above, the Panasonic Lumix DMC-GM1's additional range of Photo Style options, selected via the menu screens could feel almost superfluous as inevitably there is some overlap. Whilst the default camera setting is the unadulterated ‘standard', we also get a dedicated ‘Vivid' option here, doing much the same job as the ‘Expressive' filter, plus Natural, Monochrome, Scenery, Portrait and Custom setting. For each there is the additional ability to fine tune results using a series of on-screen sliders. Via these we can adjust contrast, sharpness, saturation and even control noise reduction. 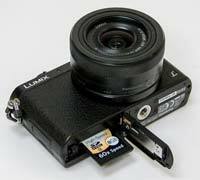 So plenty of opportunity with this Lumix to get the shot spot on, in camera. If we've a grumble it's that the backplate buttons on the GM1 are as tiny as you'd expect them to be on the fashion conscious pocket snapshot camera the rear plate so closely resembles. Top right of the back plate is a dedicated video record button for Full HD 1920x1080 pixels video clips in either the tightly compressed AVCHD format or the more widely accessible MPEG4. Nothing wrong with that. But we did find kick starting recording a little awkward as said button requires a precise thumbnail press to get going; this is largely because the button itself has a raised surround to prevent accidental activation, which means that a press with the pad of your thumb just won't do it. That being said, Auto focus when in video mode is commendably quick to respond. On a number of occasions when adjusting our framing mid flow we didn't notice the camera making its focus adjustments. Our subject nearly always remained sharp, or at least drifted into focus a second or so afterward. Also requiring precision to select it is the even smaller playback button directly below which is set completely flush with the backplate, as are the Quick Men/delete and display buttons in the bottom right hand corner of the camera back. Whilst this is the case with the ‘hard' keys, so it is with the virtual on screen icons selected via the touch screen, which are ranged fairly close together at times. There's no virtual equivalent of the video record button however. Sitting in the midst of the physical buttons which are all ranged to the right of the screen is a familiar four-way circular control pad, with a scroll wheel tracing its circumference. Intuitively a menu/set button has been placed in the centre, and around it are four further settings: for exposure (+/- 5EV), white balance, drive modes (including bracketing and high speed burst options) and self timer options, and AF modes. The options here are the familiar face detection that we find on most compacts, a very useful AF tracking option, a single area or 23 area AF option plus ‘pinpoint' setting. In terms of the display, it's possible to call up virtual horizon and live histogram settings as well as clear the screen of peripheral information with a subsequent press, as one would imagine. Whilst the left hand flank of the body is clear of any controls or flaps, if viewing the GM1 from the back, the right hand side features a sturdy feeling door protecting separate USB and HDMI output ports, as one would expect to find on a modern camera at this price. The bottom of the compact meanwhile features a screw thread for attaching a tripod, sitting just behind and dead centre of the lens mount, whilst alongside sits a covered compartment for both rechargeable battery and media card. As well as the high-ish price, we were less impressed with the GM1's battery performance. Here we get just 220 shots from a full charge, which falls short of the 330 or so images achievable with the best of competing compact system cameras, though looks less shaky when compared with a similar amount of images from Nikon's AW1.